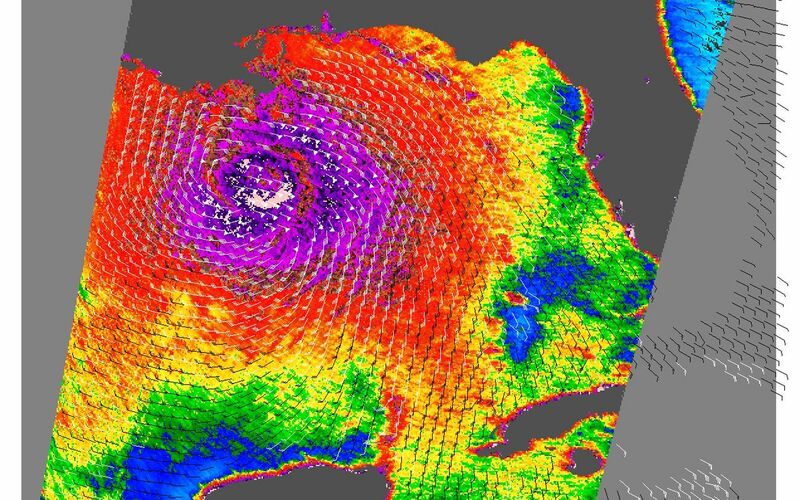 Nearly the whole of the Gulf of Mexico was churning with the powerful winds and rains of Hurricane Katrina on August 28, 2005, when NASA's QuikScat satellite captured this image. The image depicts relative wind speeds swirling around the calm center of the storm. 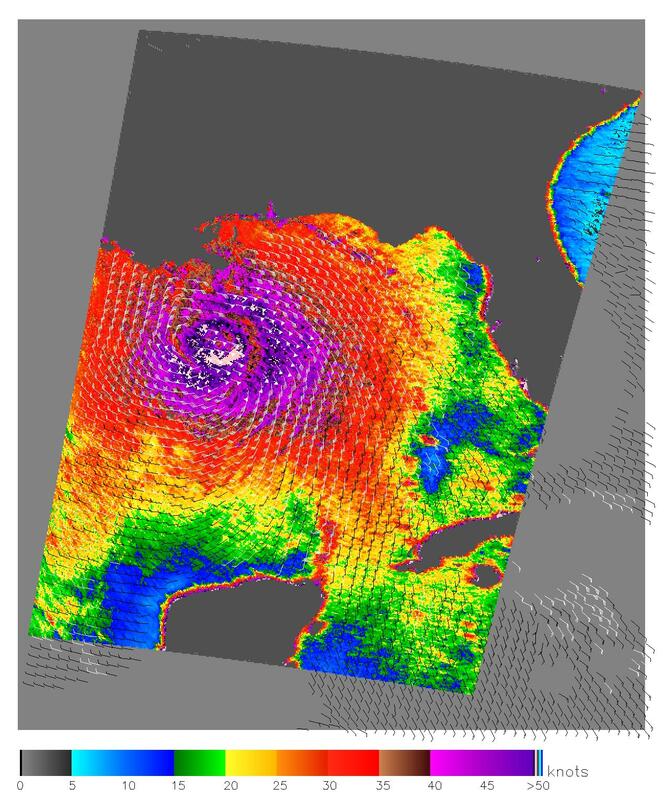 The highest wind speeds, shown in shades of purple, circle a well-defined eye, with gradually weakening winds radiating outward. The barbs reveal wind direction, and the white barbs show heavy rainfall. At the time this image was taken, the National Hurricane Center reported that Katrina had winds of 160 miles per hour (257 kilometers per hour or 140 knots) with stronger gusts and was moving north-northwest at about 10 mph (16 km/hr). The storm weakened slightly before coming ashore, but was still a powerfully destructive storm. Why don't the wind speeds shown here match those reported by the National Hurricane Center? QuikScat measures near surface wind speeds over the ocean based on how the winds affect the ocean. The satellite sends out high frequency radio waves, some of which bounce off the ocean and return to the satellite. Rough, storm-tossed seas return more of the waves, creating a strong signal, while a mirror-smooth surface returns a weaker signal. To learn to match wind speeds with the type of signal that returns to the satellite, scientists compare wind measurements taken by ocean buoys to the strength of the signal received by the satellite. 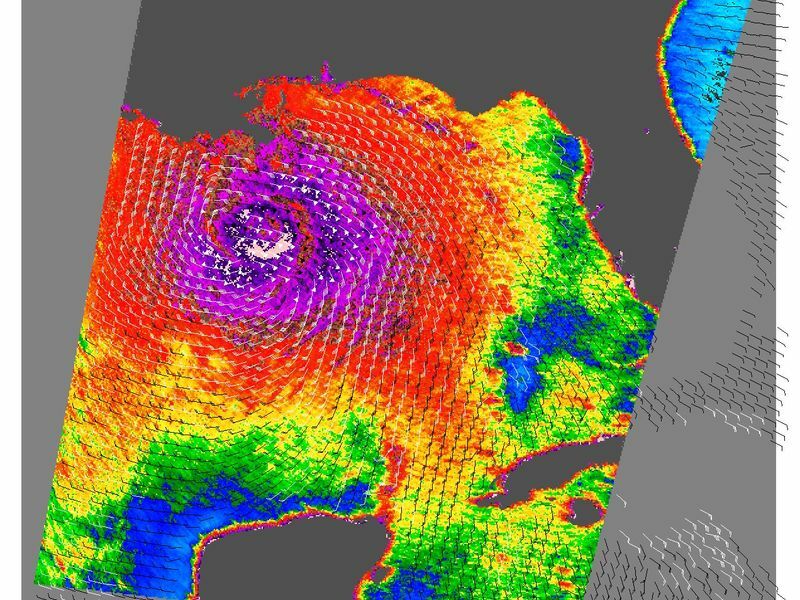 The more measurements scientists have, the more accurately they can correlate wind speed to the returning radar signal. Storms as large as Katrina are rare. 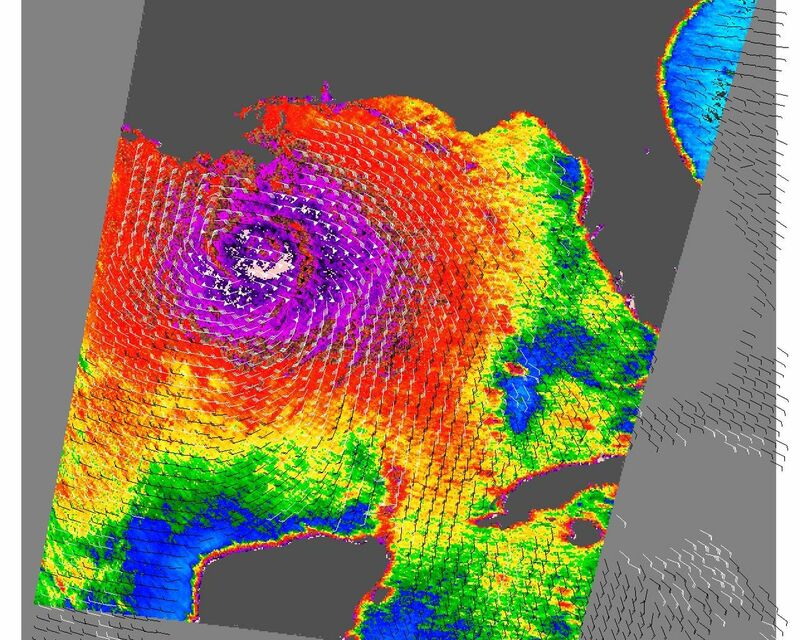 This means that scientists have few buoy measurements to compare to the data they get from the satellite and can;t match the satellite measurements to exact wind speeds. Instead, the image provides a clear picture of relative wind speeds, showing how large the strong center of the storm is and which direction winds are blowing. For official warnings and information about Hurricane Katrina, please visit the National Hurricane Center. 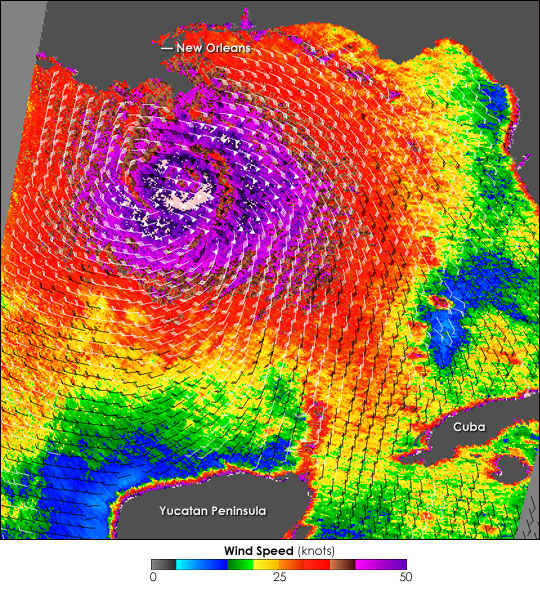 To learn more about measuring winds from space, check out NASA's Winds web site.